Your car’s engine is the heart of your vehicle and it is the most vital part that keeps your car running smoothly. The combustion process in the engine causes dust, dirt and debris to be attracted by the engine and these can cause considerable damage. Also, when the oil travels through the engine of the car, it collects dust, debris, metal particles and several other contaminants and with time, the oil gets progressively dirtier and starts losing its capability to lubricate and clean the engine, potentially causing permanent damage to it. Engine oil is extremely important to keep your car’s engine working smoothly. But to ensure that the lubrication system of your vehicle is functioning optimally, you need an efficient oil filter. To keep the engine of your vehicle clean and prevent any damage, an oil filter is used, which is an extremely important component to protect your car. The oil filter screens out all the dust, dirt and debris and stops them from entering the vehicle’s engine and circulating through it. And since the oil filter is a vital component, necessary for the protection of your car’s engine, you must ensure that you use a high-quality oil filter. The oil filter comprises many mechanical components such as the filter medium, tapping plate, center steel tube, anti-drain back valve, pleats, retainer, etc. to keep the engine of the car protected and safe from contaminants. The oil filter cleans any contaminants present in the engine oil before it enters the car engine by passing via the primary and secondary media. The primary media helps to filter particles that are around 25-30 microns, whereas, the secondary media can filter small particles of around 5-10 microns. There are many types of oil filters, and the type you use essentially depends on the type of the car. Oil filters can be high-performance, micro-glass or synthetic or any other type. The different kinds of oil filters function differently and it is extremely important to choose the right kind of oil filter depending on your car type. Ensure that you consider some important factors before you before buying an oil filter for your car and select the one that is most suitable for your vehicle. You must know the type of engine of your car before you decide on the oil filter that is most suitable for your car. There are different types of oil filters and the way each of them work and their performance varies for different kinds of cars. Another important factor to consider while buying an oil filter for your car is the size of the filter. The filter must be compatible and fit your vehicle. If the filter is too big or too small and does not fit the car properly, then it is useless to spend money on it. Ensure that you check the size of the oil filter before buying one. You must ensure that you get the correct size of the oil filter, as the wrong size can cause the engine to seize due to lack of oil and you would have to spend a significant amount of money to buy a new engine. The oil filter quality depends on different aspects such as the design of the oil filter, its cleaning efficiency and durability. You must select the filter depending on its efficiency rating which is the standard of manufacturing for the internal components of the oil filter and the maximum size of particle that can pass through the filter. The standard capture rate is usually more than 99% of the particles down to around 25 microns and some oil filters have greater capture levels of down to 20 microns. You should opt for a filter that captures a greater percentage and smaller sizes of particles. This is essentially the material that comprises the filtration component of the oil filter. This impacts the filtration efficiency, lifespan and durability of the oil filter. Today, most of the latest models of oil filters make use of media that is made of synthetic glass blend which offers the best filtration and a long life of the oil filter. This is basically the recommended time for usage of the filter media before it wears out and this is typically measured in kilometers or miles that the car has run and, in some cases, if the car is not driven for a long time, there is also a time duration for the filter. Filters usually have lifespans of around 10 to 15,000 miles; however, to get a good performance, it is better to change the filter more frequently. 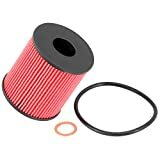 For most cars, 3-6 months and between 5-8,000 miles is a good time to change the filter. The oil filter that you use depends on the oil being used in the car. Most of the common filters work well with conventional, synthetic or synthetic-blend oils. However, in the case of high-end filters, they can be used only with high-end synthetic oils. If you use conventional oil with a filter that is meant for synthetic oil, it is not really a technical issue; however, it’s a risk that you may want to avoid. 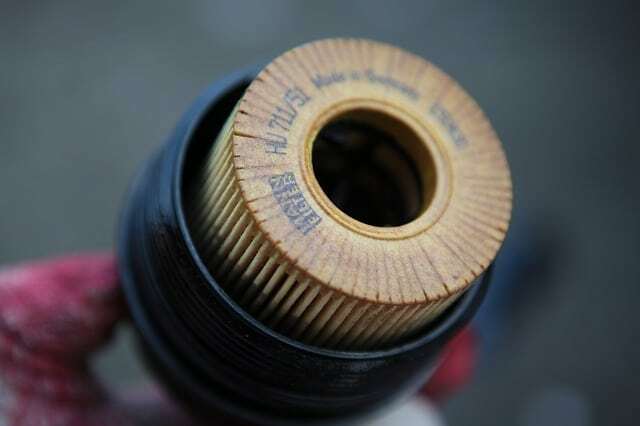 Most of the modern filters have an inbuilt anti-drain back valve which prevents the oil from flowing back into the filter when the engine of the car is not running and the oil pump is not working. This essentially helps the engine to remain lubricated when it starts up as the oil pump does not have to start over completely and can start from the point when the engine stopped. There are several options for oil filters available in the market and it can become rather confusing to decide on the one that is best for your vehicle. Here, we have reviewed some of the best oil filters in the market to help you in making your choice. If you’re looking for an oil filter to protect your engine from rust, dust and any other kind of contaminants, then you could consider the ACDelco Professional Fuel Filter. Belonging to GM Motors, ACDelco has been around for close to a century and they manufacture components for brands like Cadillac, Chevrolet and Buick. The ACDelco Fuel Filter traps contaminants and enables your engine to perform efficiently. The high-quality ACDelco Fuel Filter is suitable for several kinds of engines. The oil filter is durable and long-lasting and the filtration media of the ACDelco is wire-backed cellulose, which has a filtration efficiency of around 98% at 25 to 30 microns. The oil filter contains a center tube, metal-end caps and an anti-drain back valve, which delivers excellent performance. Silicone and metal components offer impressive durability. Filter seal offers enhanced burst strength. Manufactured by a reputed manufacturer. Oil filter has plastic components inside. Cellulose media less efficient than synthetic. Not suitable for all car models. While the cellulose media of the ACDelco Fuel Filter may not be as efficient as synthetic material, it is quite inexpensive. However, the ACDelco may be worth considering as there is not much of a practical difference and for a fairly reasonable price tag and the durability it offers, the ACDelco fuel filter is a good buy. The Motorcraft Fuel Filter works extremely well and prevents even the minutest dirt, debris or contaminants from passing through the filter. Recommended by Ford, the Motorcraft fuel filter kit comes along with the filter unit, as well as the O-ring, which makes it very easy for you to install the fuel filter and it takes just around 30 minutes for installation. And, the filter is also extremely easy to maintain. The fuel filter prevents poor starting, stalling and engine failure. It ensures that the fuel flow is optimal, thereby improving vehicle performance. The filter removes around 90% of the particles that are 20 microns or larger in size. Filter bracket may not rotate. Users may find it difficult to remove the oil filter. The Motorcraft Fuel Filter is authentic and reliable and is trusted by users. It works very efficiently in preventing the contaminants from entering the engine. Built to offer strength and durability, the Motorcraft Fuel Filter is a good product to consider for your vehicle. When you are looking for components for your car, undoubtedly, Bosch is one of the leading brands you can trust. The Premium FILTECH Oil Filter from Bosch is equipped with media screens which can filter contaminants that can be harmful to your vehicle. The strong and sturdy steel base plates and the housing of the oil filter help to prevent poor fitting, warping and leaks. The gasket of the fuel filter is highly lubricated, which allows it to seal tightly, but it is also easy to remove. The Bosch oil filter is equipped with rolled seams which are double-locked that form into a leak-proof canister that is convenient to use. Solid oil filter that filters all types of debris and contaminants very well. Fits well and does not leak. May not fit some car models. The Bosch FILTECH Oil Filter is an excellent, high-quality oil filter ensures that your car has clean oil whenever you start it. The fuel filter is durable and offers excellent performance making the Bosch FILTECH among the best oil filters in the market. Oil filters are extremely important for the protection of the engine of your car and so, you must ensure that you buy the best one for your vehicle. The large variety of fuel filters available in the market may make it difficult for you to choose the right one. However, it is a good idea to do your homework and understand the various features of the various oil filters, which will help you make an informed choice.